The event was opened with a reading from the Quran. Shepparton’s Tongan and Maori communities showed support through song and dance with a powerful Haka performed. Greater Shepparton Youth of Colour and Culture and La Trobe University student Ali Albattaat opened with a powerful speech. Shepparton’s Tongan community led with song and dance in their own language. “March 15 is a day that will never be forgotten,” he said. “We lost 50 people who were doing nothing other than worshipping our Allah. Mr Albattaat highlighted the heroes of the attack and vowed to never mention the attacker’s name during the event. City of Greater Shepparton Mayor Kim O’Keeffe addressed the crowd and said she was proud of the community’s youth for driving the event. “The aim of tonight’s event will enable us to become better at what we already do,” she said. A question and answer panel discussion was then held and included Dhami Singh, Greater Shepparton police Inspector Troy Hargadon, Kaz Gurney from the Goulburn Valley Community Legal Centre, Greater Shepparton Youth of Colour and Culture members Mariam Mgoter and Fazela Abbasi and moderator Corina Modderman, Head of Social Sciences at La Trobe University’s Shepparton campus. Ms Mgoter and Ms Abbasi explained how they had felt fear since the attacks in Christchurch, being visible Muslim women in the community. “It is not the majority but it is a small minority,” Ms Mgoter said, referring to some hateful comments she had received from passers-by. 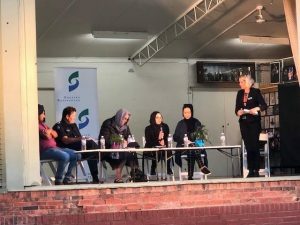 Co-organiser Betul Tuna thanked all who volunteered their time for the event, which was held in Shepparton’s Queen’s Gardens.